2.1.1. How long will the migration take? 2.1.2. How many conversion hosts do I need? 2.1.3. Which transformation method, VDDK or SSH? This guide describes how to plan, perform, and troubleshoot an infrastructure migration from VMware to Red Hat Virtualization or Red Hat OpenStack Platform. The migration is performed with Red Hat CloudForms. Red Hat Virtualization (RHV) is a virtualization platform built on Red Hat Enterprise Linux. You can manage your virtual infrastructure, including hosts, virtual machines, networks, storage, and users, from a centralized graphical user interface or with a REST API (for more information, see the Red Hat Virtualization documentation). Red Hat OpenStack Platform enables you to create a scaleable, fault-tolerant, private or public cloud based on Red Hat Enterprise Linux (for more information, see the Red Hat OpenStack Platform documentation). The migration process is performed with CloudForms 4.7, a user interface for managing the infrastructure (for more information, see the Red Hat CloudForms documentation). "How long will the migration take?" "How many conversion hosts do I need?" "Which datapath transformation option, VDDK or SSH?" This diagram describes the workflow of a migration to Red Hat Virtualization. You create and run a migration plan in CloudForms. CloudForms uses the migration plan to locate the source virtual machines. If you are using VDDK transformation, CloudForms captures the ESXi host fingerprint for authentication during the virtual machine conversion process. virt-v2v-wrapper connects to the source datastore through the ESXi host. virt-v2v streams the source disks to the target data domain and converts the source disks. virt-v2v-wrapper creates a target RHV virtual machine, using the source virtual machine’s metadata in order to maintain its attributes (tags, power state, MAC address, CPU count, memory, disks, and virtual machine name) after migration. The migration process is complete and the migration plan’s status is displayed in CloudForms. This diagram describes the workflow of a migration to OpenStack Platform. After the source disks are converted, virt-v2v detaches the volumes from the conversion host, migrates the volumes to the destination project, and creates the network ports defined in the infrastructure mapping. virt-v2v-wrapper creates the target OpenStack Platform instance with the flavor and security group defined in the migration plan. virt-v2v attaches the newly created network ports and the disks mapped in the block storage to the instance and the instance is powered on. During the planning phase, you will formulate a specific migration goal, for example, "I want to migrate 2000 virtual machines, with 200 TB of data, in less than 6 months". Identify the hosts and virtual machines to be migrated. What is the maximum number of disks, virtual machines, or NICs that I can migrate? There is no maximum number of disks or virtual machines that you can migrate. However, you may not want to migrate all your virtual machines at the same time, in order to minimize the impact on your users. You can migrate a maximum of four NICs with each virtual machine. If you exceed the capabilities of your environment, the migrations will fail. This situation could affect existing applications running on virtual machines attached to the network and storage. What operating systems can I migrate? For a list of supported guest operating systems, see https://access.redhat.com/articles/1351473. For a list of certified guest operating systems, see https://access.redhat.com/articles/973163. Although it is possible to migrate guest operating systems that are not certified for Red Hat Virtualization or OpenStack Platform, these guests are not officially supported. What resources does my target environment require? Your target environment must be large enough to run the migrated virtual machines in addition to the source virtual machines. The source virtual machines are not affected by the migration process. Identify resource gaps, such as bandwidth, storage, licenses, or a suitable maintenance window. What impact will the migration have on my users? Assess the effects the migration may have on a production environment. It may be possible to migrate your applications in phases, without downtime at the application layer, if the applications are distributed in a high-availability architecture. Check whether users will lose access to critical applications. There are no specific rules to determine how long the actual migration will take. This is determined on a case-by-case basis. The following migration examples are provided as a guide. The number of conversion hosts you create depends on the size of your migration. All the virtual machines in the migration plan are migrated at the same time, in parallel. The number of virtual machines that you can migrate simultaneously depends on your infrastructure capabilities. Each migration requires a certain amount of network bandwidth, I/O throughput, and processing power for the conversion process. Multiple conversion hosts provide load-balancing and better performance, even for small migrations. Conversion hosts and providers are limited to ten concurrent migrations, unless you change the default maximum number of concurrent migrations (see Section 4.3, “Changing the maximum number of concurrent migrations”). Test your environment thoroughly before the migration to determine how many migrations it can support without negative effects, for example, five conversion hosts, each running ten concurrent migrations. You will configure the conversion hosts to use either the VMware Virtual Disk Development kit (VDDK) or SSH as the transformation method for converting the virtual machines. The choice is determined by the number of virtual machines you are migrating and the capabilities of your infrastructure. The following table compares the options. The following recommendations will minimize the impact of the migration on your environment. Ensure that you have sufficient space for the migration. The migration process does not delete the original virtual machines. Schedule your migration carefully, to minimize the impact on your users. Prepare your users for downtime. Currently, IMS supports only cold migration. Virtual machines are powered off gracefully as part of the migration process. Move critical applications during maintenance windows. How are the virtual machines grouped now? Which virtual machines should be migrated together? Which workloads or linked applications should be migrated together? What applications must remain available? 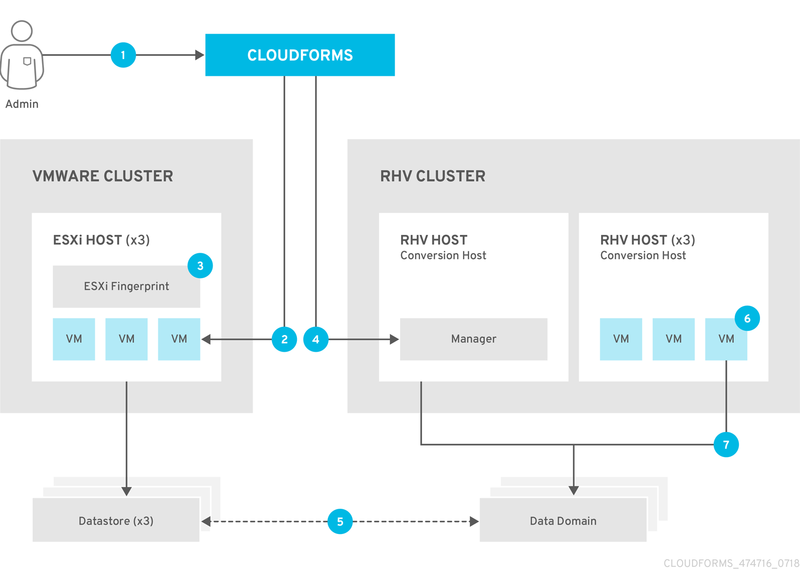 Deploy conversion hosts on multiple hypervisors. Deploy conversion hosts on a compute node with nested virtualization enabled (see https://docs.openstack.org/devstack/latest/guides/devstack-with-nested-kvm.html). Nested virtualization is a technology preview. Create multiple migration plans for finer control. Perform test migrations with different maximum numbers of concurrent migrations to assess the capabilities of your environment’s infrastructure (see Section 4.3, “Changing the maximum number of concurrent migrations”). Optionally, you can change the maximum number of concurrent migrations for better performance and control of the migration process. Extend the VMware network to the target environment. The network configuration must not be changed in any way during the migration. IP addresses, VLANs, and other network configurations should not be changed before or after migration because the conversion process preserves the source virtual machine MAC addresses. Prepare the source virtual machines. If you are using SSH transformation, configure the VMware hypervisors. Install VMware Tools to capture IP addresses. For download and installation instructions, navigate to https://www.vmware.com/support/ws5/doc/new_guest_tools_ws.html. Ensure that attached disks are not encrypted. Ensure that each NIC has no more than one IPv4 and/or one IPv6 address. Ensure that the virtual machine names contain only upper- or lower-case letters, numbers, underscores (_), hyphens (-), or periods (.). International characters and spaces are not permitted. Red Hat Virtualization only: Ensure that source virtual machine names do not duplicate the names of existing RHV virtual machines. SSH transformation requires passwordless access to the VMware hypervisors. Passwordless access involves enabling SSH access on the VMware hypervisors, generating an SSH key pair, and copying the public key to the VMware hypervisors. You will use the private key of the SSH key pair in Section 3.3, “Configuring the conversion hosts for VDDK or SSH”. Using a single SSH key pair for all conversion hosts is recommended because the key pair is used only for virtual machine conversion and simplifies conversion host management. If you wish to use a dedicated SSH key pair for each conversion host, you can create multiple key pairs and copy all the public keys to all the VMware hypervisors. Enable SSH access on each VMware hypervisor. For instructions, navigate to https://docs.vmware.com/en/VMware-vSphere/index.html. In the navigation pane, click vSphere version → ESXi and vCenter Server → VMware ESXi Installation and Setup → Installing and Setting Up ESXi → Setting Up ESXi → Enable ESXi Shell and SSH Access with the Direct Console User Interface. If your security processes allow you to collect the VMware hypervisors' public keys, save them for Section 3.3, “Configuring the conversion hosts for VDDK or SSH”. Generate an SSH key pair. Copy the public key to all the VMware hypervisors in /etc/ssh/keys-root/authorized_keys. You are ready to prepare the target environment. Install Red Hat Virtualization Manager 4.2 on the Manager machine (see Installing the Red Hat Virtualization Manager in the Red Hat Virtualization Installation Guide). Install Red Hat Virtualization Host 4.2 or Red Hat Enterprise Linux 7.6 on physical machines (see Installing Red Hat Virtualization Host or Installing Red Hat Enterprise Linux Hosts in the Red Hat Virtualization Installation Guide). Some of these hosts will be deployed as conversion hosts. The number of conversion hosts depends on your migration size and infrastructure capabilities. See Section 2.1.2, “How many conversion hosts do I need?” for details. Create and attach data and ISO storage domains to the data center, ensuring that the data domain has sufficient space for the migrated virtual machines (see Storage in the Red Hat Virtualization Administration Guide). IMS only supports shared storage, such as NFS, iSCSI, or FCP. Local storage is not supported. Upload the VirtIO and Guest Tool image files to the ISO storage domain (see Uploading the VirtIO and Guest Tool Image Files to an ISO Storage Domain in the Red Hat Virtualization Administration Guide). The VirtIO file name must include the version number: virtio-win-version.iso. The Guest Tool is required for migrating Windows virtual machines. Otherwise, SSH will fail for the vdsm user (see https://bugzilla.redhat.com/show_bug.cgi?id=1544379). This issue cannot be resolved by modifying the configuration file because the file is restored during upgrades. Install Red Hat CloudForms 4.7 on the Manager machine (see Installing Red Hat CloudForms on Red Hat Virtualization). Add VMware and Red Hat Virtualization as providers (see Adding a VMware vCenter Provider and Adding a Red Hat Virtualization Provider in Red Hat CloudForms: Managing Providers) . Removing or changing a provider, including refreshing hosts, before, during, or after the migration will cause errors in the infrastructure mappings and migration plans. You are ready to configure the conversion hosts for VDDK or SSH. Install Red Hat OpenStack Platform 13 or 14 (see Red Hat OpenStack Platform Director Installation and Usage). Create provider networks for the target instances to preserve the IP addresses of the source virtual machines (see Create a network in the Red Hat OpenStack Platform Networking Guide). Create a project for the conversion hosts and whatever destination projects you require for the target instances (see Create a Project in the Red Hat OpenStack Platform Users and Identity Management Guide). Ensure that the admin user has member and admin roles in the conversion and destination projects (see Edit a Project in the Red Hat OpenStack Platform Users and Identity Management Guide). Set at least one volume type for the target block storage (see Create a Volume and Changing a Volume’s Type (Volume Re-typing) in the Red Hat OpenStack Platform Storage Guide). Otherwise, CloudForms cannot detect the storage when you create the infrastructure mapping. Ensure that the storage backends have sufficient space for the migrated virtual machines. If you are using Ceph storage, you will require three times the space of the source virtual machines for the migrated virtual machines. Ceph, by default, creates two replicas of an object, for a total of three copies (see Get the Number of Object Replicas in the Red Hat Ceph Storage: Storage Strategies Guide). The migrated virtual machines use all of the space because it is preallocated. For example, if you migrate a virtual machine with a 100 GB disk, you will require 300 GB of Ceph storage, regardless of how much data is on the disk. You can use the ftrim command on the migrated virtual machines to reduce the space required, as a postmigration task or playbook. Outbound traffic is enabled by default. If you have changed this setting, enable ports 902 (CloudForms to VMware) and 5480 (virt-v2v to vCenter). Create flavors for the source virtual machines. If you do not create custom flavors, CloudForms will try to map each source virtual machine to an existing flavor. Install Red Hat CloudForms 4.7 (see Installing Red Hat CloudForms on Red Hat OpenStack Platform). Add VMware and OpenStack Platform as providers (see Adding a VMware vCenter Provider and Adding an OpenStack Infrastructure Provider in Red Hat CloudForms: Managing Providers). Removing or changing a provider before, during, or after the migration will cause errors in the infrastructure mappings and migration plans. You download the conversion host appliance and use it to deploy the conversion host instances. The number of conversion hosts you deploy depends on your migration size and infrastructure capabilities. See Section 2.1.2, “How many conversion hosts do I need?” for details. In the A-Z tab, click Red Hat OpenStack Platform. Click the green Download Latest button to go to the OpenStack Platform download page. Click the Product Software tab and download the RHOSP V2V Image for Red Hat OpenStack Director (x86_64). Always download the latest version of the OpenStack Platform conversion appliance because it contains patches and fixes. The OpenStack Platform 14 conversion appliance can be used with both OpenStack Platform 13 and 14. Upload the appliance to Glance storage. 1 GB RAM for each concurrent migration, starting at 10 GB RAM (the default maximum number of concurrent migrations per conversion host is 10). If you raise the number of concurrent migrations, you should increase the RAM accordingly. If you lower the number of concurrent conversions, you should not go below 8 GB RAM. Deploy the conversion hosts on more than one hypervisor. Deploy the conversion hosts on a compute node with nested virtualization enabled. See https://docs.openstack.org/devstack/latest/guides/devstack-with-nested-kvm.html. Nested virtualization is a technology preview. Increase the disk space of the instance to accommodate its file system. The instance is created from an image, but the disk space defined in the image will not be sufficient. You can either extend the partition, and subsequently extend the PV in the VG, to the required size, or you can create a new partition and add it as a PV to the VG. You must resize lv_root to use all available disk space because the image will not use it by default. Log in to the Manager machine using SSH. Click VMware SDK & API Product Documentation to expand. Click VMware Virtual Disk Development Kit (VDDK). Click Latest Releases and select the latest VDDK release. Download and save the VDDK package (VMware-vix-disklib-version.x86_64.tar.gz), recording its URL. # Maximum number of concurrent conversions per host. Default is `10`. # Whether to validate certificate of CloudForms server. Default is `true`. connection_configurations has a single endpoint, whose role is default. The CA certificate is stored as /etc/pki/ovirt-engine/apache-ca.pem on the Manager machine. This is the private key of the SSH key pair that you created in Configuring the VMware hypervisors for SSH transformation. Running the conversion_host_enable playbook more than once on the same host creates multiple entries in the CloudForms database for that host. If you are using VDDK, you can authenticate the conversion hosts in CloudForms. See Authenticating the Red Hat Virtualization conversion hosts in CloudForms. If you are using SSH, you are ready to copy the VMware keys to the conversion hosts. See Copying the VMware keys for Red Hat Virtualization. To prevent man-in-the-middle attacks, the conversion hosts do not accept the VMware keys by default for SSH transformation. Instead, the known_hosts file of each conversion host must be populated with the public keys of the VMware hypervisors. Depending on the security processes of your VMware environment, you can either obtain a list of public keys from the VMware system administrators, if they collected the keys when they enabled SSH access on the hypervisors, or you can use ssh-keyscan. You must run ssh-keyscan multiple times, once for each VMware hypervisor. Otherwise your conversion hosts will not have all the VMware keys and the migration will fail. The socket_domain format is /tmp/ssh-socket_number/agent.pid. These commands must be run for each VMware hypervisor. If the SSH connection is successful, you can authenticate the conversion hosts in CloudForms. See Authenticating the Red Hat Virtualization conversion hosts in CloudForms. Click Compute → Infrastructure → Hosts and select a Red Hat Virtualization conversion host. Click the Configuration drop-down button and select Edit Selected items. In the Default tab of the Endpoints section, enter the Username and the Password for root. Click Validate and wait for validation to complete. You can create an infrastructure mapping. See Section 4.1, “Creating an infrastructure mapping”. Optionally, you can verify the conversion hosts in a browser. See Section 3.3.3, “(Optional) Verifying the conversion hosts in a browser”. Download the latest conversion host appliance. Redeploy the conversion hosts. 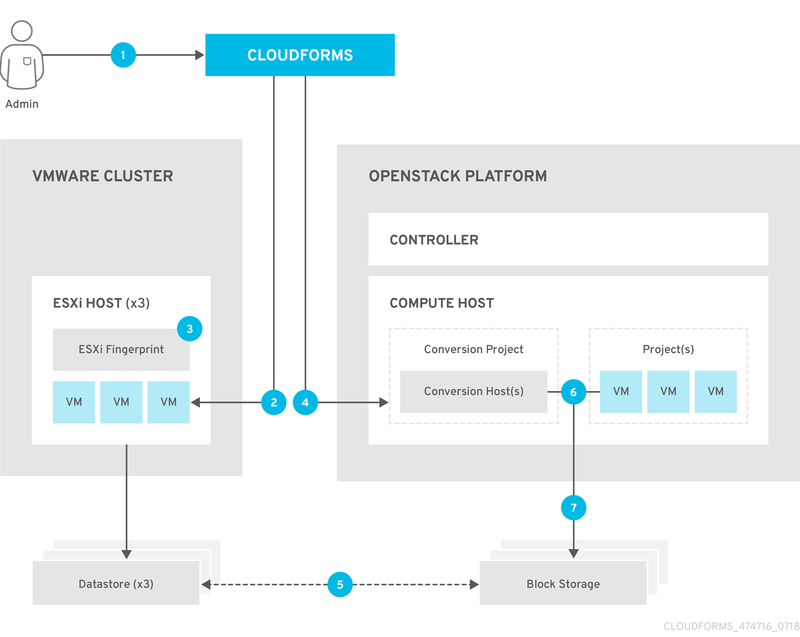 See Deploying the OpenStack Platform conversion hosts. If you deploy your own CA chain, use the chain that signs the OpenStack Platform API certificates (see SSL/TLS Certificate Configuration in Red Hat OpenStack Platform Director Installation and Usage). If you are using VDDK, you can create an infrastructure mapping. See Section 4.1, “Creating an infrastructure mapping”. If you are using SSH, you are ready to copy the VMware keys to the conversion hosts. See Copying the VMware keys for OpenStack Platform. Repeat the procedure on each conversion host, to ensure that all the conversion hosts have all the VMware keys. Connect to each VMware hypervisor from each conversion host as cloud-user to verify the SSH connection. If the SSH connection to a VMware hypervisor fails, check Configuring the VMware hypervisors for SSH transformation. If the connection is successful, you can create an infrastructure mapping. See Section 4.1, “Creating an infrastructure mapping”. This procedure displays the names and number of your conversion hosts. It does not check SSH or VDDK transformation, which is done by the conversion_host_check playbook. In the Sign in window, enter the Username and Password and click Sign in. Performing test migrations with different maximum numbers of concurrent migrations is highly recommended, to assess the capabilities of your environment’s infrastructure. See Section 4.3, “Changing the maximum number of concurrent migrations”. The infrastructure mapping maps your source infrastructure to your target environment. If you add or remove providers or provider objects from an infrastructure mapping, the mapping will have missing resource errors (see Section 5.2, “Infrastructure mapping errors”). You must delete the infrastructure mapping and create a new one. Click Compute → Migration → Infrastructure Mappings. Enter the infrastructure mapping Name and (optional) Description. Select a Source Provider \ Datacenter \ Cluster source cluster and a (RHV) Target Provider \ Datacenter \ Cluster or (OpenStack Platform) Target Provider \ Project. If the target cluster or project does not contain a conversion host, a warning icon ( ) appears. You can create and save an infrastructure mapping, but you must configure conversion hosts before you can run a migration plan. Click Add Mapping. You can map additional clusters. Select a source cluster whose datastores you want to map. Click Add Mapping. You can map additional datastores. Select a source cluster from the drop-down list. Click Add Mapping. You can map the networks of additional source clusters. Click Close. Your infrastructure mapping is saved in Compute → Migration → Infrastructure Mappings. 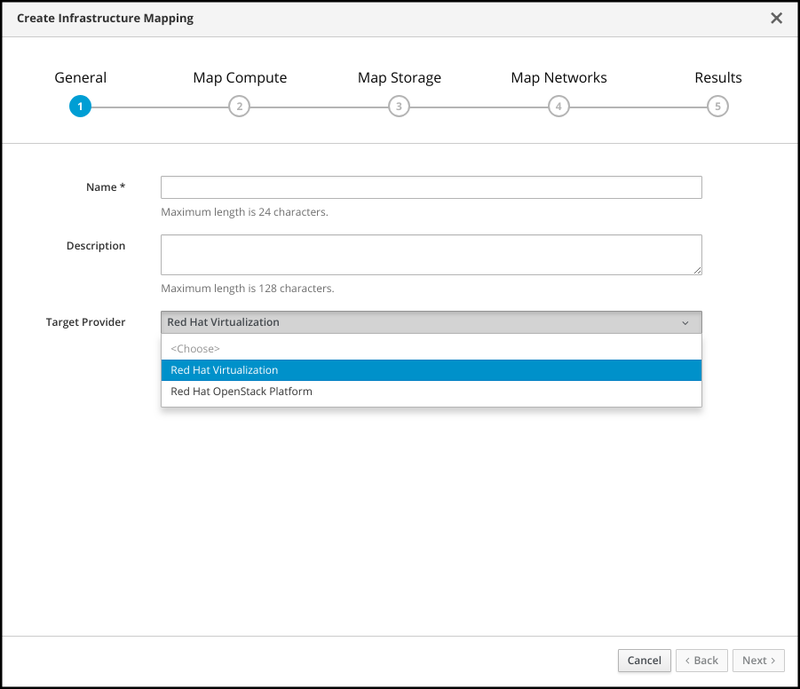 After you have created an infrastructure mapping, you can create and run a migration plan. You can previously migrated machines to the migration plan with a CSV file. This is also recommended for large migrations. See Section 4.2.1.1, “Creating a CSV file to add virtual machines to the migration plan”. RHEL/Linux virtual machines require additional configuration to preserve their IP addresses after migration. See Section 4.2.1.2, “Creating a RHEL premigration playbook for RHEL/Linux source virtual machines”. You can add an Ansible repository, credentials, and playbooks to CloudForms. See Section 4.2.1.3, “Adding Ansible playbooks to CloudForms for premigration and postmigration tasks”. If these conditions do not apply, you are ready to create a migration plan. See Section 4.2.1.1, “Creating a CSV file to add virtual machines to the migration plan”. See Section 4.2.1.2, “Creating a RHEL premigration playbook for RHEL/Linux source virtual machines”. See Section 4.2.1.3, “Adding Ansible playbooks to CloudForms for premigration and postmigration tasks”. If these conditions do not apply, you can create a migration plan. See Section 4.2.2, “Creating a migration plan”. If you are migrating virtual machines that were migrated in the past, you should create a CSV file to add the virtual machines to the migration plan, because the migration plan cannot discover them automatically. If you are migrating a large number of virtual machines, using a CSV file to add the virtual machines is faster than selecting them manually. For large OpenStack Platform migrations, you can use a CSV file to set the security groups and flavors, instead of setting them individually in CloudForms. Optional. Only required if virtual machines have identical Name fields. Optional. Only required if virtual machines have identical Name and Host fields. Optional, for OpenStack Platform only. The default is Default. Optional, for OpenStack Platform only. If you do not create flavors for the migration or if you leave this field blank, CloudForms tries to map the source virtual machines to existing flavors. You are ready to create a migration plan. See Section 4.2.2, “Creating a migration plan”. If you are migrating virtual machines running RHEL or other Linux operating system, a RHEL premigration playbook ensures that their IP addresses are accessible after migration. The RHEL premigration playbook calls the Ansible ims.rhel_premigration role (see https://galaxy.ansible.com/fdupont_redhat/ims_rhel_pre_migration for documentation). The ims.rhel_premigration role assumes that either the rhel-6-server-rpms or the rhel-7-server-rpms repository is enabled in the source virtual machine when it installs qemu-guest-agent. If you have disabled the repository, re-enable it in the RHEL premigration playbook. You will select this playbook as a premigration playbook service in the Advanced options screen when you create the migration plan. CloudForms requires a minimum of one Ansible playbook repository, one playbook, and one set of credentials. Enable the Embedded Ansible server role (see Enabling the Embedded Ansible Server Role in Red Hat CloudForms: Managing Providers). Add an Ansible playbook repository (see Adding a Playbook Repository in Red Hat CloudForms: Managing Providers). Add the Ansible credentials for your virtual machines (see Credentials in Red Hat CloudForms: Managing Providers). Add a playbook as an Ansible service catalog item (see Creating an Ansible Playbook Service Catalog Item in Red Hat CloudForms: Provisioning Virtual Machines and Instances). You will select the playbooks and the virtual machines on which they run in the Advanced Options screen when you create the migration plan. A CSV file is optional, but recommended, for large migrations because it is faster than manually selecting virtual machines or setting an OpenStack Platform security group and flavor for each virtual machine. See Section 4.2.1.1, “Creating a CSV file to add virtual machines to the migration plan”. Click Compute → Migration → Migration Plans. Select an infrastructure mapping from the drop-down list. If you select an OpenStack Platform mapping, an Instance Properties screen appears after the VMs screen. Enter the migration plan Name and (optional) Description. Import a CSV file with a list of VMs to be migrated. A CSV file is required for previously migrated source virtual machines and highly recommended for large migrations. If you selected Choose from a list of VMs discovered in the selected infrastructure mapping, select the virtual machines for migration. You can search for virtual machines by VM Name, Data Center, Cluster, and Folder. Browse to the CSV file and click Open. If you try to import an invalid CVS file (for example, virtual machines with a duplicate Name field and no Host/Provider field to distinguish them, or with a duplicate Name field and duplicate Host/Provider fields), the Create Migration Plan wizard will freeze. This is a known issue and will be addressed in a future release. If the Create Migration Plan wizard cannot discover or import the source virtual machines, see Section 5.3, “Migration plan errors” for possible causes. Click the pencil icon to edit the network or flavor of each selected virtual machine. Flavors that are too small for the virtual machine are marked with an asterisk (*). If you have not created flavors for the migration, CloudForms tries to map the source virtual machines to existing flavors. Select a premigration and/or postmigration playbook service from the dropdown lists (see Section 4.2.1.3, “Adding Ansible playbooks to CloudForms for premigration and postmigration tasks” for details). Select the virtual machines on which to run the playbook services. 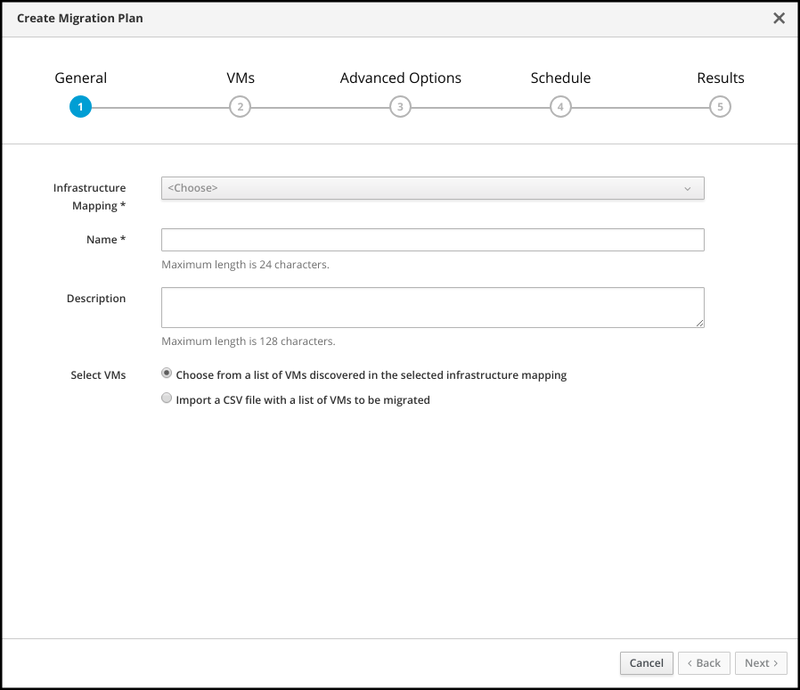 The migration plan is saved in Migration Plans Not Started and will not run unless you schedule it (see Scheduling a saved migration plan) or click Migrate to run the scheduled migration plan immediately. The migration plan may take some time to complete. Progress bars indicate the amount of transferred data, the number of migrated virtual machines, and the elapsed time. See Viewing a migration plan in progress for details. Optionally, you can cancel a migration plan in progress. When the migration plan has finished, click Migration Plans Complete to view the status of the migration plan. The completed migration plan shows the status of the migrated virtual machines. If there are errors, see Chapter 5, Troubleshooting. In the migration plans list, you can click the More Actions icon ( ) to archive, edit, or delete a migration plan. Click Migration Plans Not Started. Click the Schedule button of a migration plan. In the Schedule Migration Plan window, select a date and time and click Schedule. The plan’s status is Migration Scheduled with the date and time. Click Migration Plans in Progress. Click a migration plan name to view its details, including the status of the migrating virtual machines. The counter in Compute → Migration → Migration Plans may be a few seconds ahead of the counter in the migration plan details view. This is because the Migration Plans counter displays the total time for running the migration plan, while the details counter displays the time for migrating the virtual machines. Select a migration plan and click Cancel Migration. Click Cancel Migrations to confirm the cancellation. The canceled migration appears in Migration Plans Complete with a red x indicating that the plan did not complete successfully. Delete newly created target virtual machines or instances, if any, to avoid name conflicts with the migrating VMware virtual machines. Delete newly created disks in the target datastore to free up space. OpenStack Platform only: Delete newly created network ports of failed instances. Click the Retry button beside the failed migration plan. You can change the maximum number of concurrent migrations for conversion hosts or providers to control the impact of the migration process on your infrastructure. For VDDK, the maximum concurrent migrations per conversion host should not be greater than 20. Otherwise, network overload will cause the migration to fail. The provider setting has priority over the conversion host setting. For example, if the maximum number of concurrent migrations for a provider is 20 and for five conversion hosts, 3, the maximum number of concurrent migrations is 20, not 15 (5 conversion hosts x 3 concurrent migrations). An increase in the maximum number of concurrent migrations affects all migration plans immediately. Virtual machines that are queued to migrate will migrate in greater numbers. A decrease maximum number of concurrent migrations affects only future migration plans. Migration plans that are in progress will use the limit that was set when the plan was created. In CloudForms, click Compute → Migration → Migration Settings and select the new limit. The following commands are performed on the command line of the CloudForms machine. To identify errors, check the migration logs (Section 5.1, “Migration logs”). Section 5.5, “Known Issues” provides information about issues that will be addressed in a future release. The conversion host logs and the CloudForms migration log can help with troubleshooting. virt-v2v: Debug output from virt-v2v itself. This log tracks the core of the virtual machine migration process, including libguestfs traces and disk migration details. virt-v2v-wrapper: Log of the daemonizing wrapper for virt-v2v. This log traces the orchestration of the virtual machine conversion on the conversion host, including disk migration percentages and virt-v2v error reporting. If you need to open a Red Hat Support call, you will be required to submit both the migration (virt-v2v) log and virt-v2v-wrapper log for analysis. Log in to the conversion host using SSH. If you have multiple conversion hosts, you can view the name of a virtual machine’s conversion host by clicking the information icon ( ) of the virtual machine in the migration plan’s details view. Click a completed migration plan to view its details. Click Download Log → Migration Log. This log traces the orchestration of the virtual machine migration in CloudForms. Log in to the CloudForms machine using SSH. View the migration log, /var/www/miq/vmdb/log/automation.log. Networks missing, Datastores missing, and Clusters missing error messages: If you create an infrastructure mapping and change a provider or refresh the RHV hosts, the provider’s object IDs change. Delete the infrastructure mapping and create a new one. OpenStack Platform volume type not detected: Check that you have set at least one volume type. See Group Volume Settings with Volume Types in the Red Hat OpenStack Platform Storage Guide for the storage. If the virtual machines are being migrated for the first time and are not discovered by the migration plan, check the source datastores and networks in the infrastructure mapping. If the virtual machines have been migrated in the past, they cannot be discovered by the migration plan. Use a CSV file to add the virtual machines to the migration plan. If the virtual machines cannot be added to the migration plan with a CSV file, check the CSV file format and fields. Create a new migration plan with the updated CSV file. Create Migration Plan wizard hang while importing CSV file. This error is caused by an invalid CVS file (for example, virtual machines with a duplicate Name field and no Host/Provider field to distinguish them, or with a duplicate Name field and duplicate Host/Provider fields). You must reload the web page. This is a known issue and will be addressed in a future release. Denied State error (IMS 1.1). If a migration plan fails immediately and the migration plan displays a Denied State error message, check that you have created and configured the conversion hosts correctly. Cancel the migration plan and retry it. If you have not configured conversion hosts, the following error appears after running the migration plan (IMS 1.2): Unable to migrate VMs because no conversion host was configured at the time of the attempted migration. See the product documentation for information on configuring conversion hosts. You can create and save a migration plan whose infrastructure mapping does not contain conversion hosts, but you cannot run the migration plan without conversion hosts. If the IP address of a migrated RHEL (or other Linux-based operating system) virtual machine is not accessible, create a RHEL premigration playbook and add it to the migration plan. Check that VMware Tools is installed on the source virtual machine. If you are using SSH transformation, see Configuring the VMware hypervisors for SSH transformation. Virtual machine name duplicates an existing target virtual machine name. If you are using SSSD with single sign-on, reinstall ipa-client without the OpenSSH client. Check that SSH transformation was correctly configured. See Configuring the VMware hypervisors for SSH transformation and Section 3.3, “Configuring the conversion hosts for VDDK or SSH”. Virtual machine powered off: The virtual machine must be powered on at the time of migration. SSH transformation failure: Check that SSH transformation was correctly configured. See Configuring the VMware hypervisors for SSH transformation and Section 3.3, “Configuring the conversion hosts for VDDK or SSH”. Red Hat Virtualization: Run yum update on the conversion hosts. OpenStack Platform: Download the latest conversion host appliance and re-deploy the conversion hosts (see Deploying OpenStack Platform conversion hosts).